KATHMANDU, May 29: Nepal's economy has bounced back after two bad years punctuated by earthquake and the Indian blockade. Tabling the economic survey report in parliament on Sunday, Finance Minister Krishna Bahadur Mahara said that the economy, which contracted because of the earthquake and supply disruption in the boarder areas, has now fully rebounded. The survey is based on data for the first eight months of the current fiscal year. Mahara cited a favorable monsoon, improvement in capital spending, a positive investment climate and availability of electricity as factors behind the economic growth of 6.94 percent, the highest in 23 years. Gross production and services are projected to rebound by 6.94 percent to Rs 2,627 billion (at current prices) from below 1 percent growth the last fiscal year, which was affected by earthquake coupled with the Indian blockade. The national income last year was Rs 2,281 billion at current prices . The rebound has improved the average earnings of each Nepali. Each Nepali earned US $ 862 (Rs 88,268) on average this fiscal year, up from US $ 757 the previous year. Per capita income is projected to increase by 6.1 percent (at constant prices), according to the economic survey. 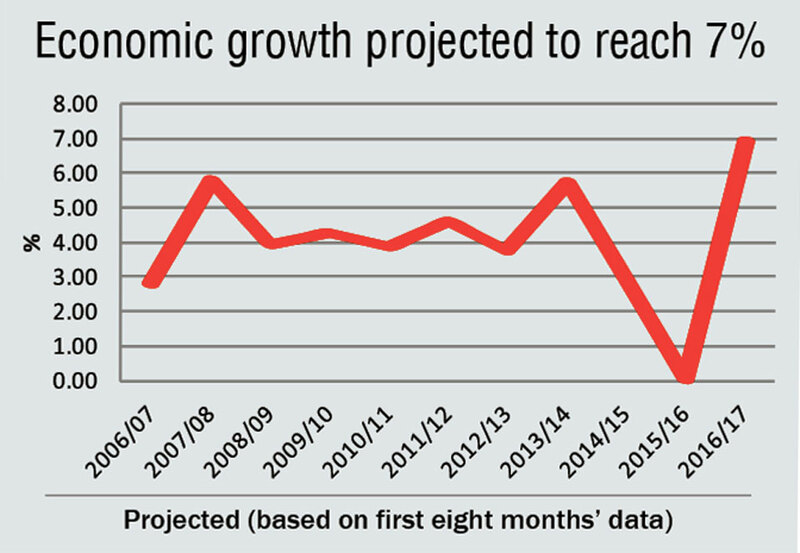 This means that the average annual income of each Nepali has doubled in the past 11 years. Each Nepali was earning US $ 414 per annum in 2006/07. Growth in the industrial sector is also at a record 10.97 percent, following a negative growth of 6.45 percent last fiscal year. The service and agricultural sectors are projected to grow by 6.9 percent and 5.32 percent respectively. Inflation has been tamed at 5.1 percent against the target of 6.5 percent, as supply improved. Growth in agricultural output and improvement in supply contributed to lowering inflation, which was 9.7 percent in the same period last year. The total agricultural output is projected to increase by 13 percent to 9.74 million metric tons this fiscal year. Meanwhile, only 849 kilometers of road in total has been built in the review period. A total of 358 kilometers was blacktopped. The number of cell phone users has increased to 32.8 million. Two all-weather airports have been added, bringing the total up to 24. Enrolment in schools has continued to decline as in recent years. Total enrolment in school education was 6,953,114, down from 7,277,932 in 2012/13. But students in higher education have increased by 17.8 percent to 441,461. A total of 23 health institutions were added in the eight-month period. But primary health care centers have declined to 210 from 216. A total of 89 new health posts have been established. Only 34 beds have been added at health institutions while the number of doctors and staff nurses/assistant nurse midwives increased by 90 and 77 to 2,640 and 20,510 respectively. Record progress has been achieved in digging 5.25 kilometers of tunnel in eight months under the Melamchi Water Supply Project. The power cuts for households have been reduced significantly while electricity supply is continuous in Kathmandu and Pokhara. Industries have only 4 hours of load shedding during peak hour. Hydropower plants of 105.3 installed capacity started generation in the period, which is a growth of 12.3 percent, and the country's total generation has reached 961 MW. A total of 554,614 households have received the first tranche of Rs 50,000 in quake grant while the distribution process for the second and third tranches has been started. The challenges the survey has set out for the next year to sustain this year's growth rate are providing banking services to all 744 local units as well as enhancing financial literacy.